Possum Living is just as relevant today as it was back in post-hippie 1978 when it was first published. 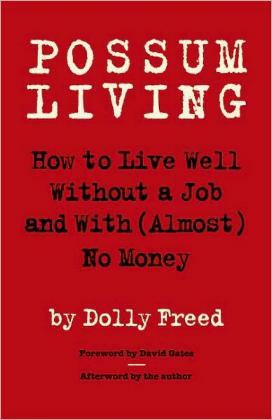 This new edition offers Dolly Freed's later-in-life lessons and reflections. I know of quite a few people who would love (and have tried) to live off the land, far away from the rat race and urban (and often suburban) living. I know sometimes those people include me as I'm finding that there are too many people, too few values and respect for others and their property, and I have about $500 to my name and don't have a job. Why wouldn't I want to get away? Dolly and her dad started off their new lives after Mom left and divorced Dad. There was no longer income from Mom's candle-making business but they had a house, "free and clear, and a little money in the bank", and apparently, that's all you need. It's surprising to discover just how little you need to live, especially nowadays. Ms. Freed says, "It's easier to learn to do without some of the things that money can buy than to earn the money to buy them." She also says, "If you can't go the whole route, at least go part way. If you can't become a nonconsumer, aim to be a mini-consumer. Okay?" Applicable today — spend less and save more. Dolly eloquently describes their vegetable growing and harvesting, moonshine making, collecting fruits from nearby, canning and preserving, baiting and catching and preparing fish and turtles, housing, clothing, and much more, all with a great sense of humor. If I found myself is a similar situation, I think I'd become a vegetarian as I just couldn't kill and clean anything, especially home-grown rabbits or even a turtle. Fish possibly, turtle not. Dolly gives food for thought when it comes to believing economists and banks, and we should have some doubt, which in turn makes us look at our needs more closely. She gives an update about her life now, her career (astonishing achievements! ), and her thoughts on "possum living" these days. I think I have a book in me too. Conclusion - A pretty graphic depiction of another way-of-life that doesn't cost much to enjoy.